During the spring of 2013, we set out to identify 20 veterinarians who have had extraordinary influence on the beef or dairy industries. We discovered early on that this would not be a simple task, as people across the industry have tremendous respect and admiration for the veterinarians with whom they work. To develop our list, we ran a call for nominations multiple times in Bovine Veterinarian, Dairy Herd Management, Drovers/ CattleNetwork and their associated websites and e-newsletters. We asked veterinarians, producers, and industry stakeholders to send us their nominations. The nomination process served as an initial vote, with each individual nomination for a veterinarian counting as a single vote. That process generated a great list of names, many with multiple votes, and we needed a tie-breaker vote to finalize the list of 20. For that, we recruited three individuals with broad experience and knowledge of the veterinary community. That group included: Greg Goodell, DVM, The Dairy Authority, Greeley, Colo.; Bill Swafford, DVM, executive secretary, Academy of Veterinary Consultants (AVC); and Geni Wren, communications director, American Association of Bovine Practitioners (AABP) and former editor of Bovine Veterinarian. Their votes provided enough separation to identify our final list of 20. We could easily have made the list longer, as virtually all the nominees clearly have had profound influence on their clients, colleagues and industry. However, the final list reads like a “who’s who” in bovine veterinary medicine, with a diverse sample of dairy and beef veterinarians, private practitioners, consultants and academicians. So, here they are. In addition to his success as a researcher, educator and practitioner, Dr. Apley has become a highly visible and passionate advocate for judicious use of antimicrobial drugs in animal agriculture. He began his veterinary medicine career with a general practice in Kansas, followed by a feedlot consulting and contract research practice in Colorado. He later joined the faculty at Iowa State University and worked there until 2005, when he moved toKansas State University. At K-State, he teaches beef production medicine, large-animal medicine and pharmacology courses. Dr. Bechtol has operated his consulting business and feedyard research facility in the Texas Panhandle for more than 20 years. His “cattle accounting system” was one of the original recordkeeping systems for animal health in the early ’70s. He also has maintained an active role as a consultant for some of the largest feedyards in the country and has mentored countless young people across the beef industry. He is a charter member and first president of the AVC and past president of AABP. He was named AVC Consultant of the Year in 1986. Dr. Cortese serves as director of Cattle Veterinary Operation - Cattle Immunology for Zoetis and is widely recognized as an expert in bovine immunology and BVD diagnosis and control. He worked in private practice prior to moving to industry. Several nominations cited his outstanding ability to communicate, teach and build relationships. One nomination came from his daughter, who also works for Zoetis. “I don’t think a week goes by,” she writes, “that I don’t talk to someone with a story about the time my dad came out and saved this dairy, or helped this practice solve this problem, or decreased mortality at this feedlot. Dr. Fetrow serves as a professor of veterinary medicine at the University of Minnesota and has helped shape modern dairy production medicine since the late 1970s. 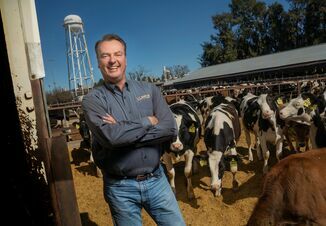 Nominations cite him as one of the first veterinarians to bring an economics perspective to dairy health management and as a pioneer in the development of on-farm monitoring systems and data analysis. He was a driving force behind the National Center of Excellence in Dairy Production Medicine, launched in 2012 at the University of Minnesota. Dr. Griffin is a feedlot production medicine veterinarian and professor with the University of Nebraska’s Great Plains Veterinary Education Center. 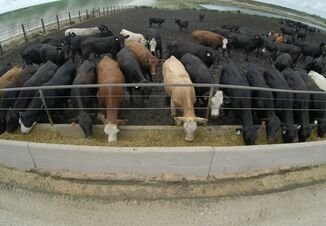 As a feedyard veterinarian in Oklahoma in the 1980s, he helped pioneer the Beef Quality Assurance (BQA) program, working to develop residue-avoidance protocols and other BQA standards and programs. In 2012, he was the inaugural recipient of the BQA Educator of the Year award. After several years as a technical services veterinarian with Zoetis, Dr. Grotelueschen recently returned to academia as director and professor at the Great Plains Veterinary Education Center. He began his career with a mixed practice in Curtis, Neb., and served as lab director for Nebraska’s veterinary diagnostic laboratory. He has served as chairman of NCBA’s BVD Working Group, chairman of AVC’s ad hoc BVD Control/Eradication Committee and is a past president of AVC. Dr. Hilton serves on the faculty at the School of Veterinary Medicine at Purdue University. He is also a member of the National Board of Veterinary Medical Examiners Examination Development Advisory Board. In 2012, he was elected to the board of directors for the Western Veterinary Conference (WVC). Nominations for this list cited his dedication to teaching and to bovine clinical practice. Hilton is also the state coordinator of the Indiana Beef Integrated Resource Management program. Dr. Jim is a founding partner of Feedlot Health Management Services, a private veterinary practice focused on feedlot and calf grower sectors of the beef cattle industries in Canada and the United States. He helped introduce computerized animal-health record-keeping systems to the feeding industry and continues to develop, design and implement a new generation of feedlot computer software for the collection of individual animal-health and production data. Andy Johnson, DVM, Grande Milk Marketing, LLC, Brownsville, Wis. Known as “the udder doctor,” Dr. Johnson serves as herd-health and wellness veterinarian for Grande Milk Marketing. He has consulted in 26 countries and 45 states, on dairies ranging from 20 to over 20,000 dairy cows. His specialties are quality milk production, new parlor design and performance, and cow comfort. He chaired the National Mastitis Council sub-committee on milking machine evaluation and developed the new airflow protocols that have become the US standards. Dr. Maas served on the faculty at the UC-Davis School of Veterinary Medicine from 1988 until he retired earlier this year. As an Extension veterinarian, he became well known across California and around the country for his research, education and practical applications benefiting beef producers. His extensive industry involvement includes serving as president and board chairman for the American College of Veterinary Nutrition. He also served as chair of the California Cattlemen’s Association Cattle Health Committee, and chair of the NCBA’s Producer Education Committee. Del Miles, DVM, MS, Veterinary Research & Consulting Services, LLC, Greeley, Colo.
Dr. Miles has operated his research and consulting service since 1984, focusing on feedlot veterinary medicine and beef cattle production research. He is widely regarded as one of the leaders in feedyard veterinary medicine. Prior to forming his consulting business, Miles worked in mixed-and small-animal practices, academia and industry. He is a founding member and past president of AVC. His awards include AVC Consultant of the Year, AABP Excellence in Preventive Veterinary Medicine and AABP Bovine Practitioner of the Year. Tom Noffsinger, DVM, Professional Animal Consultation, Benkelman,Neb. Dr. Noffsinger is a true innovator in veterinary consulting. In 2003, he and colleague Lynn Locatelli, DVM, brought stockmanship expert Bud Williams into their practice in Nebraska to teach low-stress animal-handling techniques to cow-calf producers and feedyard crews. 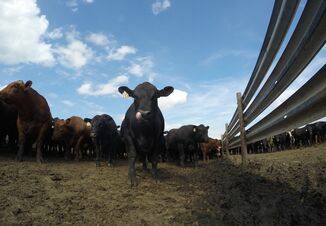 Since then, Noffsinger has continued to practice and teach low-stress stockmanship and has pioneered methods for minimizing stress across the production system. Dr. Nordlund has conducted extensive research on dairy facilities, leading to innovations that improve the health and well-being of cattle. He and his colleagues at the University of Wisconsin have developed positive ventilation systems for calf raising and retrofitted barns across Wisconsin to improve calf health. He also has studied associations between freestall design and dairy cow lameness, transition cow housing and fresh cow disease. Gatz Riddell, DVM, MS, ACT, American Association of Bovine Practitioners, Auburn, Ga.
Dr. Riddell accomplishes a lot of things out of the limelight. He has been an educator, mentor and leader in the dairy and beef cattle veterinary industry for over 30 years, including his tenure as executive vice president for the AABP. Prior to his position with AABP, Riddell practiced in Tennessee and joined the faculty at Auburn University in 1984. He served as AABP president in 1996. In 1968, Dr. Sanders and his wife Dr. Judy Sanders established a store-front veterinary office in Urbana, Ohio. The practice grew to a nationally recognized veterinary hospital for large and small animals, which became the Urbana Veterinary Clinic, Inc. In 2006, Sanders took a position on the faculty at Ohio State University. Sanders has authored several books including Dr. Sanders Guide to Boosting Dairy Profits and Milk Them for All Their Worth! Bob Smith, DVM, Veterinary Research and Consulting Services LLC, Stillwater, Okla.
Dr. Smith worked as a field services clinician for 15 years at Oklahoma State University. He then worked as a feedlot veterinarian for two years before returning to Oklahoma State for 10 years as the McCasland Chair in Beef Health and Production. He has worked with Veterinary Research and Consulting Services for 12 years, with practice emphasis on feedlot and stocker medicine and management. He has served as president of AABP, AVC and WVC, and chaired the NCBA CattleHealth and Well-being Committee. With more than 35 years in the animal health industry, Dr. Spire served as a post veterinarian and captain in the U.S. Army, a professor at Kansas State University (KSU), and now in technical services for Merck Animal Health. While at KSU, Dr. Spire’s research efforts focused on beef quality assurance, feedyard and stocker health and management, disease surveillance, embryo transfer and total herd management. Spire is a past president of AABP. Dr. Thomson currently serves on the faculty and as director of the Beef Cattle Institute at Kansas State University. He formerly worked as a feedyard veterinarian for Cactus Feedersin Texas. Thomson recently served as chairman of the World Organization for Animal Health Beef Cattle Production and Animal Welfare Committee. Thomson also hosts DocTalk, a weekly 30-minute television program that covers a wide range of topics relatingto animal care, animal health and food production. The program airs on RFD-TV and on BovineVetOnline.